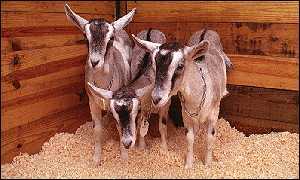 Boston (AP) April 27, 1999 -- Massachusetts researchers say they have cloned three goats that are genetically altered to produce a protein in their milk that might be used to treat heart attack and stroke victims. The cloning could mean faster and less expensive production of the protein, Antithrombin III , which has the potential to treat heart attacks and strokes and prevent blood clots. It is now being tested on humans. The cloned goats were born last fall on a farm in Charlton, the Tufts University School of Veterinary Medicine and Genzyme Transgenics Corp. of Framingham said Monday. "The results could revolutionize the biopharmaceutical industry," said Eric Overstrom, a developmental biologist at the Tufts veterinary school. "We now have a method that is a faster, reliable and more cost-effective way to produce complex pharmaceuticals for humans and animals." Currently, methods of producing human proteins for drugs include growing them in yeast and taking them from pooled human blood -- expensive, risky and low-yield methods, Overstrom said. The work is reported in the May 1st issue of Nature Biotechnology . Transgenics is the process of implanting genes from one species into the DNA of another. It is used to put human genes into animals so they will develop human diseases. The researchers also came up with a way to use fewer eggs to produce a cloned animal. It took 140 eggs to produce the first cloned goat, using an older method. But the two other cloned goats, twins, were created with only 92 eggs by using "activated" eggs that were tricked into thinking they had been fertilized. "Layering the cloning on top of the transgenics (gene-altering) work is important in getting the therapeutic proteins to the patients in the most efficient manner possible," said Sandra Nusinoff Lehrman, president and chief executive officer of Genzyme. "The cloning allows you, once you've got the cell line, to much more efficiently develop your herd." She believes there is a $200 million-a-year market for Antithrombin III in Europe, where it is used more than in this country. The cloning produces female goats, and goats have a gestation period of only five months and produce plenty of milk. The first cloned animal, Dolly was a sheep born in Edinburgh, Scotland in 1996.